Daumier intended to depict the mythology and symbolism of Don Quixote on his own terms. And this is one of several paintings in the series. During the latter part of the series, Daumier moved from painting specific scenes to generalizations that increasingly become archetypes in their own right. This is one of the latter paintings. 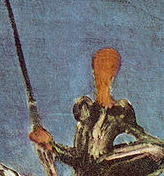 The composition of Don Quixote is sparse, but it fills the entire painting, almost giving it a larger-than-life feeling. The rider dominates the center of the painting, while the horse more than fills up the center foreground. The horse and man are proportionate to their size in the painting, but it is the man to whom one's attention is instantly drawn because his lance is raised. While the background is detailed enough to give a sense of landscape, the foreground is almost completely missing. We have no idea what the rider is looking at. The use of space is meager, with most of the space being used up in the center. However, the contents of the center more than make up for the lack of occupied space in the rest of the painting. 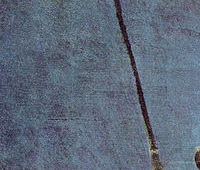 The upper third of the canvas is left almost completely bare, except for the lance that juts through it. As befits someone who started out in the medium of print-making, the colors of this painting are very simple. In the background the blue turns into a brownish orange. The change is softened by the slight bump that suggests a mountain. This orange-brown changes into a sometimes bright and sometimes muddy yellow, a transition which is made smoother by a translucent orange on the far center right. 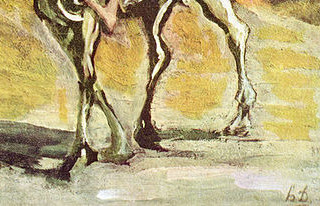 In the immediate foreground, white shoots into the painting in the form of a horse, which is unusually bright in comparison to the other colors. Most curiously, the face of the rider is brown, but his leg is revealed to be pale white. In previous paintings of this series, Daumier painted Sancho Panza alongside Don Quixote. 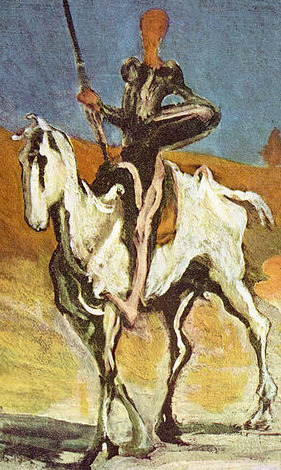 Don Quixote is usually depicted as being pale, while Sancho is darker. Scholars have suggested that Daumier's later decision to paint only Don Quixote was his attempt not to exclude Sancho, but to merge the two characters. One wonders why the face of the rider is dark, along with the hand that charges forth with the lance, while the leg is white, almost as if revealing an underbelly. Daumier started in the print-making medium, where images are conveyed through light and shadow. Therefore, it is unsurprising that, as with his prints, he has achieved a remarkable control of the light in this painting. The background is starry, but light floods into the foreground in select areas. Daumier's control of tonal nuances gives him a remarkable ability to capture space and light. He manages to make the image look quite simple, while at the same time inviting the reader in for a further look. At this stage in his life, Daumier was unable to make detailed brush strokes because he was losing his eyesight. The brush work has a passionate restraint that communicates a quiet intensity. Also, it seems to be executed with a rhythmic evenness throughout the piece, giving the entire work uniformity. The perspective is one of the rider dominating the foreground. We see him charging forth, but we do not know what is ahead. The most important part of the perspective is what is not shown, that is, the unknown.